The country is exploding with new farmers markets! More and more of us are shopping at farmers markets -- many of us for the first time. How's it done? What's it like? My first memory of farm-fresh vegetables comes from a decidedly unbustling place, a farm stand that stood hot and unprotected from sun and road dust at the edge of the still-unpaved road to the lake, a small space carved out of a farm field, the farmhouse itself hidden behind trees up a long driveway. The wooden stall was unmanned and payment was on the "honor system" -- a coffee can with a slit in the plastic top, cash only, of course, except for the occasional IOU. I suspect that the stall double-dutied as a school bus shelter during northern Minnesota's long winters. With the explosion of new farmers markets, this means that many of us are venturing into farmers markets for the first time, not knowing exactly what to expect, what we might encounter, what's there to bring home. I've been writing this post in my head for three years, collecting tips and ideas in pixels the whole time and now, have finally put them all into cogent (I hope!) form. Before we can even think about shopping at a farmers market, let's consider the shopping experience most of us are accustomed to, the corner grocery store, the modern supermarket, the mammoth warehouse store. 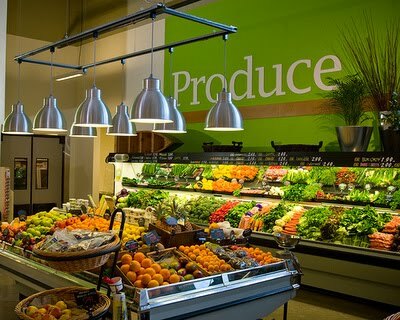 Every time we shop at one of these stores, we participate in a global food distribution system that (among other things) imports fresh produce from all over the world. It's an amazing system: Missouri has no grapefruit, no Meyer lemons, no artichokes, no mangoes. So without an international -- national! -- distribution system, we'd miss out on many food treasures. But these stores also warp our expectations. We have been taught that it's "normal" to expect the full range of fresh vegetables and fruits all year round. So many of us have lost touch with the seasonality of produce -- and meat and dairy, too, but that's another story. If we ever knew, we've forgotten which vegetables and fruits are in season during which month. Our eyes and our tastebuds don't recognize what really fresh produce looks -- and tastes -- like. We're also accustomed to produce that's perfect in appearance which rarely, if ever, runs out. We rarely have names and faces for our grocery stores' produce people, let alone for men and women who plant, water, weed, pick, clean, package, transport and unpack all those the vegetables and fruits so that we can pick through them for the most perfect specimens 24 hours a day, 7 days a week, in clean and brightly lit stores with amenities like coffee shops, cheese counters, pizza ovens, olive bars and gelato stations. Okay, now that we know what a farmers market isn't, let's talk about what it IS. SELECTION A farmers market is more like a quirky thrift store or a good garage sale. There is what there is. If you like the looks of something, buy it now, the season may end in a few days. Or a big hailstorm next week may damage the crop. TOMATOES DON'T GROW YEAR-ROUND, DON'T EXPECT ASPARAGUS IN SEPTEMBER For some of us, the opening of the farmers markets means "Yay, finally we can get good tomatoes!" But tomatoes are summer crops, not spring crops. (And think about it, we know, don't we? that summer comes earlier in Florida than in Missouri?) In Missouri, we see good Arkansas tomatoes in early July but our own tomatoes won't show up until later in the month but will last well into September and even early October. WEATHER & AVAILABILITY Weather really does make a difference, even months later. A few years ago, three days of hard freeze over Easter left Missouri bereft of local favorites in July, August and September: we had few peaches, few apples. Second plantings kept the farmers markets busy with other produce but again and again, I saw farmers shake their heads, expressing the tough year. WEATHER & TASTE Weather affects taste, too. Some years, the apples are better than others, the strawberries and asparagus sweeter. Some years, the cherry tomatoes are better from the farm that happened to get more sun and less rain. This isn't McDonald's, these aren't supermarket tomatoes. You know the caveat emptor for weight-loss promises? It applies here too. "Actual results may vary." REAL PEOPLE GROW OUR FOOD Some times I wonder how the people who sell at farmers markets do it. They work really hard during the season. Some have "real jobs" in order to keep their families on ground that's been in the family for generations. They spend the day before the market picking and packing and hauling. They often drive a long distance to reach the market at dawn. They unpack. They wait for customers. I saw one man steel his face and turn way, as he overheard one woman say to another, "That corn looks just awful. And he's charging an arm and a leg." Be nice! Be grateful! We don't have to buy what's there but really, let's not knock the fruit of someone else's labors. THE BEST GRAPEFRUIT HAS MOTTLED UGLY SKIN This is a lesson from my mother, who taught me to reach for the very ugliest grapefruit on the tree. Think of the perfect, umblemished so-called Delicious apples all lined up like red-jacketed soldiers at the grocery store. Right now I'd love to hand out slices of a perfect Delicious apple and a mottled, misshapen apple from the trees down the road. I know which one you'd love. VISIT REGULARLY, VISIT OFTEN Some weeks, especially early in the season, the pickin's might be slim. Other weeks, especially as the season progresses to the very height of growing season, the choices can become downright overwhelming! 'EYES' vs APPETITE It's easy for your 'eyes' to be bigger than your appetite. It all looks so good! To avoid buying more than can be eaten for the week, I start off with a certain amount of cash in my pocket, usually $20 or $30, when the money's gone, I'm done. CASH IS KING Speaking of cash, cash is the currency of the realm. Small bills are useful. While some times available, don't expect to use a credit card or debit card or to write a check. When getting change back, do check it, not because someone's out to cheat but because honest mistakes are easy to make when running a booth in a setting with so many distractions. BARGAINING In my experience, farmers market sellers aren't open to bargaining. You might have better luck if it's late in the day or if the market is empty. KNOW YOUR MARKET My neighborhood market is open seven days a week but for six of those days, it'd be a sleepy place if it weren't for the shaved ice stand that attracts kids and families well into the evening. It's Saturday mornings when the market is packed with people, but only before noon. BE AN EARLY BIRD For the best selection, visit a market early in the day, not late in the day. KNOW YOUR OWN RHYTHM These days, lots of us have choices when it comes to local farmers markets. I happen to love a Wednesday or Thursday market, it fits my cooking rhythm better than a Saturday market. I also like to walk a market twice -- the first time just to look, the second time to make my purchases. DON'T EXPECT COOKIE CUTTERS It pays to try different markets, too. They'll all be different, all have a little bit different ambience, the vendors will vary too. 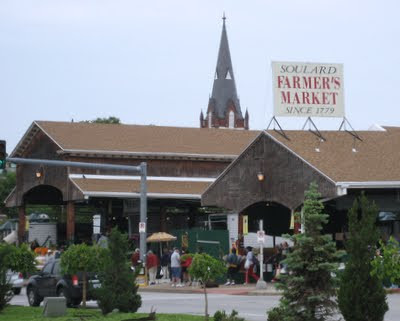 Over time, you'll also learn which vendors have what suits your taste -- at Soulard Market, I know that Scharf Farms has the best asparagus, strawberries and the sweetest cherry tomatoes you can imagine. I learned all this by regular visits, trying first one and then another. DOG-FRIENDLY? STROLLER FRIENDLY? Some markets welcome dogs, many do not. In a crowded market, a stroller can be difficult to maneuver. DON'T SQUEEZE THE CHARMIN Yes, the best way to test a tomato or a peach for freshness is to give it a little squeeze. But if you squeeze the peach, and the next person squeezes the peach and the next person squeezes the peach ... pretty soon that peach is bruised and not sellable. Instead, ask the vendor, "I'm looking for really ripe peach to eat today." (Or "I'd like peaches that will be ripe in several days.") Chances are, the vendor will know. EXPLORE A LITTLE! Chances are, you'll find vegetables never before experienced -- that's one of the great joys of a market. I remember finding long beans at the Des Moines farmers market in September, soooo many different varieties of apples and potatoes at the St. Paul farmers market in October. I love-love-love a flat-shaped variety of green been called a Romano. For roasting tomatoes, I've learned that Cascades have the meaty flesh that can withstand a long stay in the oven. Garden-fresh okra are gorgeous, so are tiny home-grown strawberries. HAVE FUN! A farmers market can be a really fun experience, and it's not always about the produce. Run into old friends. Share a recipe with someone. Grab a coffee and hang around to listen to the live music. And You? What's your best tip for shopping at a farmers market? Please do chime in -- I'd love to know your thoughts! NEVER MISS A RECIPE! (OR A HANDY-DANDY GUIDE LIKE THIS) For 'home delivery' of new recipes from A Veggie Venture, sign up here. Once you do, new recipes will be delivered, automatically, straight to your e-mail In Box. Thanks for the article! I thought you hit it right on when you said, "Ask the vendor." I can't say how many amazing foods my family has eaten because a farmer recommended it, from little crispy green Thai eggplants to a variety of ambercup squash that tasted like watermelon. 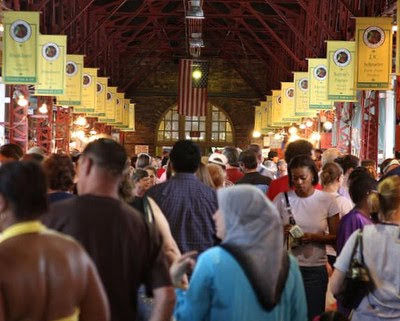 Here in Rochester (NY), we're fortunate to have a year-round public market, in addition to all the seasonal farmers' markets throughout the county. I've gotten to know many of the vendors - who's a local farmer, who's a distributor, who's got the best asparagus, who's got the first ramps of the year. Here, at least, the prices are usually competitive with the stores - particularly for in-season produce. And there's just nothing like buying your corn and sweet potatoes right of the back of the pickup truck! And definitely, ask the farmers about their wares! I've bought plenty of new-to-me vegetables with no idea what to do with them, and without exception, the vendors have given me great suggestions. Thank you for your great tips. I've just started to visit our local farmer's market north of Dallas, TX and the first time I went, there was a huge table set up with lots of beautiful veggies right at the entrance. I had $30 in my pocket and spent ALL of it at the very first table! I learned the hard way about your advice to make 2 trips through the market and not to buy anything the 1st time through. :) I love buying from local growers and will be going back every Saturday morning (the only time they're open). Good article! I've got a piece on a farmers' market (and specifically Donna, the tomato lady) scheduled for next Tuesday. Getting to know your vendors on a first name basis is not only helpful but exciting! I live in Middle Tennessee and our farmers market opens on the second Friday of May (yeah this weekend) then opens every Tuesday & Friday from 6:00am to 11:00am - I love it! And I know exactly where to go to find the best okra, green beans, jams, etc...I get started with my vendors while I wait for our garden to take off. Nothing compares to meeting the Farmers and when they know your name, well...it just warms the heart! May God bless all our farmers and all our families! Thanks for your post! Do you more often go looking for something specific for x recipe or do you just buy what looks great and try to make something with it? My experience with farmer's markets is exclusively in Sacramento, CA which is pretty much fresh produce heaven. There if you want a bargain it pays to go around 45 minutes before the market closes. Vendors would rather sell their offerings than pack them up so prices fall a lot. What I like best is getting in touch with the seasonality of the produce. It helps guide my decisions on when a strawberry shortcake or pie will taste better than great! Really great information here. I love farmer's markets, and when I go I usually go with few or no preconceived ideas of what I want to buy - I just get what looks best that day. It isn't necessary to get to know the vendors, but it's fun. If several things look really good to me but I can't or don't want to buy them all, they'll usually steer me towards what's absolutely the best buy in terms of peak flavor. The best thing is sometimes you get to buy things that very few supermarkets will ever stock (fiddlehead ferns, for example). I'm lucky enough to have a share in a CSA (Community Supported Agriculture) farm this year, but I still make my local (I'm in west TN) farmer's market my regular Saturday shopping stop. I've tried all kinds of new things thanks to the farmer's market! Here in NZ farmer's markets are now providing autumn delights. So many replies, thanks especially for including where you're from, this is fascinating to me, learning how things are different one place to the next. Kris ~ how lucky to have a year-round market! wish we had the same experience with prices here! Kevin ~ you have a tomato lady? lucky! Anonymous ~yay for the re-opening of the new season! Leslie ~ Here we are in the Midwest, the bread basket of the world, and we have "California envy". :-) Great info re the timing. Cube3u ~ Ah yes, what's "best" NOW does indeed inform the seasonal eater! I've also learned that some recipes are better for "supermarket strawberries" and others better to save for "garden strawberries". John ~ Ah yes, what a great tip, to look for things that a supermarket DOESN'T carry -- although I was surprised to learn that my cousin in British Columbia can buy frozen fiddleheads! Stellans ~ I'd love to hear how you compare the CSA and farmers market experience. I still haven't done a CSA, the garden is now the source of so much of our summer vegetables, it seems unnecessary. Robyn ~ Wow, what a great article, thanks for sharing it. Hmm. I wonder if it's the case that their grocery stores have MORE expensive produce and so are more on par with/more expensive than the farmers market. My experience here is that the farmers market is roughly twice the cost. PS I love the farmers markets in the fall!! Love your farmers' market blog. ... I don't agree with you about the scarcity of bargains at farmers' markets. I wonder if you've been getting to too many "yuppified" markets like Kirkwood. There are bargains to be had at Soulard. A week ago we bought a pineapple for $1.00, and in-season, red peppers are two or three for a dollar -- compared to one for $3.00 at Schnucks. And we got nice bouquets of lilacs from Scharfs at $5.00. I do agree strongly about positive personal contact adding to the shopping experience. Vendors are generally a nice group. Great information - thanks for sharing! We went to the Tower Grove market last weekend, it was great! As a farmer I wanted to thank you for this well thought out intro to farmers markets. It was great! I've been market farming for 6 years. It's amazing sometimes what people don't understand. Thanks. You got me a little choked up with this wonderful post, Alanna. Thank you for writing it. Here's to a bountiful and delicious growing season for everyone! Here in Perth, Australia I find the farmers market slightly cheaper than the supermarket and the quality and freshness of the produce infinate times better! I lived in Chile for two years, in the middle of the apple and potato-growing region. Best (and ugliest) apples I have ever had and who knew a potato could taste so good? But - I could only get celery half of the year. Do you realize how much you rely on celery year round? I love being able to get whatever I want in the US! Look for where the farmer is coming from on their signs. We have a few markets around here (in DC) that masquerade as farmer's markets but are really selling pretty much the same stuff you'd get at the grocery store. We belong to a CSA, but also shop at one of our local farmers markets each Saturday as well. We live in a 2nd floor condo so growing our own is not an option. I'm able to get items that I don't get from my CSA, such as cheese, yogurt, eggs, bread, meat, etc. Also sometimes the market has vegetables and fruit available that I didn't get in "my box." I agree with one of the former comments that developing personal relatiionships with the farmers is a great experience that can't be duplicated at supermarkets. It becomes so much more than just buying a few veggies. I also share recipes with them on how I used their produce. Our "potato man" will exchange free potatoes for good recipes. What a deal! It's such a cool place to mingle as well. If you have a service business you can often trader your work for some grub. Most farmers are willing to take on volunteers if you are interested, and a little tip. If you pay with quarters the farmers will love you! Great place to actually ask and figure out where your food is coming from, how it is produced, and how you can grow it on your own. Nice article! Dallas has one of the better FM's around for my money. We have one here, but it's so expensive ($4 for dz eggs-$3/lb jalapenos), that's it's not really fun to shop there. I've grown/sold too, and these prices are just....greedy. All markets aren't created equal, but the good ones are a pure joy to shop.